You must be a member of the Tokyo Changemakers Group to attend this activity. Would you like to join this group? TELL was the life line organization and invited to our social impact night in November Protected content . get to know their activities. This carpet event will be partially donated to TELL. If you are interested in, PLEASE REGISTER BY YOURSELF. You do not have to buy carpet but if you really want to, you can. Please note that you can come there at anytime from 16: Protected content ! Looking for that perfect piece to complete your home? 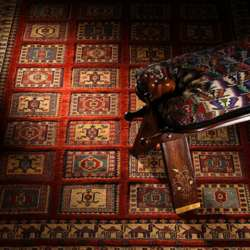 Once again, Eastern Carpets and the Tokyo American Club Women's Group will host a relaxed evening of education and bidding for exquisite, handwoven carpets and rugs from Asia and the Middle East. In turn, a portion of the proceeds will be donated to TELL Lifeline. The entrance fee will include a delicious buffet and a drink. And, if you buy a carpet, your entrance fee is refunded. TAC members can register via the TAC website, but non-members are welcome and encouraged to join as well! If you're not a TAC member, please email Protected content to register.